Sugarlands Distilling Company in Gatlinburg is a place to taste many different flavors of shine, take the tour to see the moonshiner’s art in action, buy jars of moonshine, apparel or mountain merchandise – and listen to the wonderful bands and musicians that Sugarlands brings to play on the Spirit Stage in back of the stillhouse. Sugarlands offers free music performances throughout the year from a variety of great musicians and bands from near and far. Sugarlands opened its doors in 2014 and since then has brought a whole world of music, fun and of course Tennessee moonshine to the area. The Sugarlands in the Smoky Mountains were an inaccessible area of gorges and mountains with a preponderance of sugar maple trees – hence the name. Settlers grew corn, but all produce was bulky and hard to drive to market across the rocky terrain. Distilling moonshine was a much better way to package the fruits of the land. This was illegal, but the Sugarlands were rarely troubled by outsiders. Moonshine is legal in Tennessee – if you pay your taxes and get a license from the state. Sugarlands Distilling Company has such a license, as well as a store of tales from the earlier times. Visitors are welcomed to take a bench or rocking chair and listen to Appalachian history told by storytellers, as well as to enjoy the live music presented several nights of the week. The distillery offers tours of its operation that are family friendly, informative, and usually hilarious. All the staff at Sugarlands have a flair for humor and anecdote, and kids are welcome and catered to at all the functions – except the sampling of course, which they have to watch over a soft drink. There’s an expert tour also, for those who want to dive deep into the technicalities of distilling. Sugarlands has started producing whisky too, in small amounts, as well as the currently 14 varieties of moonshine, with some flavors you might not have thought of – try the butter pecan creme – and served in some remarkable cocktails. The company has won numerous awards for the quality of its products, which are sourced locally and currently available in almost half the states of the Union (and growing). Sugarland’s music is a seemingly endless stream of talent performing bluegrass and country, from ballads to band jams, and featuring a lot of original music originating from Nashville to New jersey, Oregon to Kentucky, and all points in between. Check the playlist, which at the time of writing shows 27 different acts from across the country through the next two months – that’s pretty impressive! 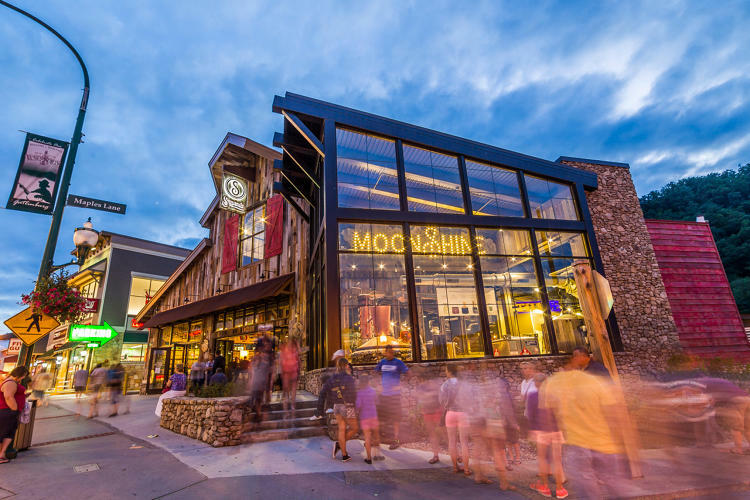 The distillery is located at 805 Parkway, next to the Sky Lift. For more information see the Sugarlands Distilling Company website.